Grab The Incredibles 2 combo pack and wrap it up to add under the tree this year. You won’t be disappointed! It's been fourteen years since we were first introduced to and fell in love with Mr. Incredible (Craig T. Nelson; Coach), Elastigirl (Holly Hunter; The Big Sick) and their offspring – Violet (Sarah Vowell; A.C.O.D. ), Dashiell (Huck Milner) and baby Jack Jack (Eli Fucile). They along with Frozone (Samuel L. Jackson; The Hateful Eight) helped save the world even though superhero activity was illegal and they were in hiding. It took over a decade to bring them back to the big screen but this summer Incredibles 2 debuted. Now, just in time for the Holiday gift buying season, the film has been released in 4K, Blu-ray, DVD, and Digital HD. Incredibles 2 picks up immediately after our superheroes saved the world from Underminer (John Ratzenberger; Toy Story) in the original film. We see them in hot pursuit as he digs under the banks and, despite their best efforts, steals all the money and escapes. Meanwhile, the Incredibles are the ones who are arrested since superhero activity is illegal and politicians use the destruction they caused stopping the bad guys as ammunition to keep the anti-superhero sentiment alive. However, when things seem to be at their lowest, an interesting new proposal falls into their laps. Winston Deavor (Bob Odenkirk; Better Call Saul) is a billionaire whose father believed in the superhero cause and who was killed when the superheroes went underground after being deemed illegal. Winston believes had superheroes not gone into hiding his Father would still be alive and he has made it his goal, along with his sister, Evelyn (Catherine Keener; Being John Malkovich) to have the decision reversed and bring superheroes back out in the open. They decide to use Elastigirl and fit her with a body camera so the world can see what goes into saving people. Meanwhile Mr. Incredible is at home playing "Mr. Mom". Of course, things aren't always as they seem and the Superheroes find themselves in a precarious situation but, as always, save the day in the end. Oh… and Jack Jack has powers too, lots of them! For those that loved the first movie, this second installment has a lot of the same elements and all the same players. Nelson, Hunter, Jackson, and Vowell are masterful in their delivery which brings their characters to life. The addition of Odenkirk and Keener only adds to the excellence of the story. There are so many elements that make this movie work that it is a joy to experience over and over again. Jack Jack discovering his multiple powers is a terrific addition to the film and of course, gives director/writer Brad Bird (Ratatouille) reason to bring back Edna Mode (voiced by Bird) in a magnificent way. The 4K Blu-ray presentation of 2160p resolution is everything you want it to be as the color palette, especially the red hues, pop off the screen at you. The detail is so sharp that the viewer can truly appreciate the time and work that went into creating each frame of the movie. The Dolby Atmos audio is incredible (yes, pun intended). The effects are sharp and clean and the audio surrounds the viewer drawing them into all the glorious animated action. The extras in this combo pack are housed on the Blu-ray disc and they are plentiful including a short called Bao (which was a little depressing to me), an "Auntie Edna" mini-movie, Strong Coffee: A lesion in animation with Brad Bird, deleted scenes and so much more. While not quite as good as the original film (they usually aren't), Incredibles 2 is still entertaining and fun and seeing all of Jack Jack's superpowers is a real treat. Plus, the return of Edna Mode is worth the price of admission in and of itself. Grab this combo pack and wrap it up to add under the tree this year. You won't be disappointed! 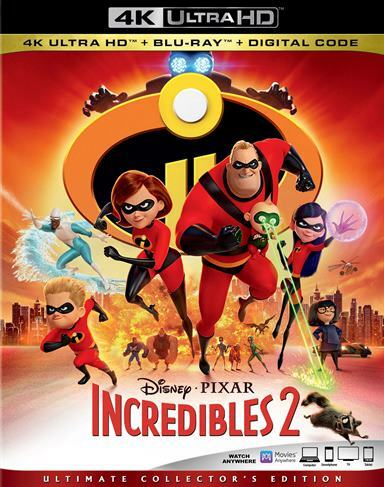 Download The Incredibles 2 from the iTunes Store in Digial HD. For more information about The Incredibles 2 visit the FlickDirect Movie Database.